As readers of on-line modeling email lists will know, Larry Kline passed away about two weeks ago. I’m preparing to attend a memorial gathering at his home in Pittsburgh, hosted by his widow Dana. My wife Mary will go with me, as we both were very good friends with the Klines for almost the entire 17 years we lived in Pittsburgh. Larry was a very skilled model railroader. He did not hesitate to scratchbuild almost anything, including steam locomotives, in his beloved O scale. He built many streetcar models, all of which operated under working overhead. His superb model of a B&O War Emergency hopper car, with all the wood parts made of wood, and all the metal parts made of metal, won First Place in Freight Cars, always a most competitive category, at the NMRA National Convention in 1977. The car even had working brakes. 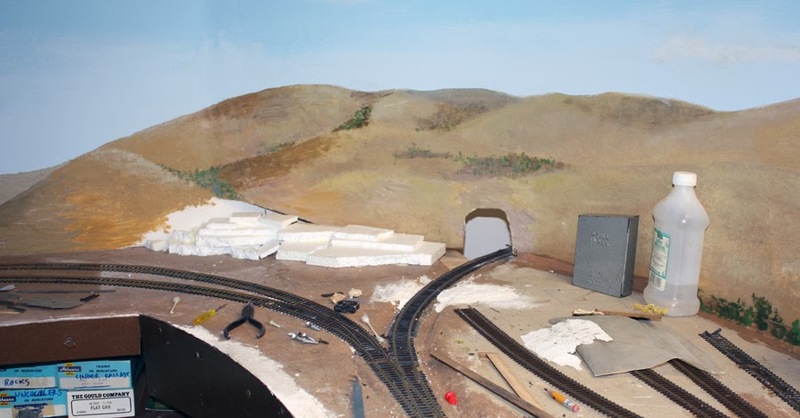 Larry had built a large O-scale layout on the third floor of his house in Squirrel Hill, and when he moved to the Bellefield area, he salvaged parts of it, and had a new basement layout mostly completed and running. I saw it last year and even ran some trains. He was a serious researcher, trained as an electrical engineer, which was his professional career at Westinghouse. Much of his work in later years was in defense electronics and computer analysis, so he couldn’t talk freely about a lot of it, but he was well respected in several sub-fields of his profession, particularly plasma behavior. Those research skills served him well as a modeler, and when he had a historical finding to communicate, it was worth listening, because you could be sure he had tracked it down to bedrock. Along with C.J. Riley, he and I formed the three-person group we called, with tongue firmly in cheek, the Iron City Ferroequinological Society. I’ve written some about our activities in a previous post. (You can read it at: http://modelingthesp.blogspot.com/2013/07/that-red-icfs-truck.html .) The three of us often traveled together to regional and national NMRA conventions, as well as attending pretty regularly the monthly meeting of our local Division 2 of Mid-Central Region (we all served as various officers of Division 2 at different times). On those convention trips, we often took detours for railfanning and photography. Here’s a nice shot of Larry (at left) and me, taken by C.J. The photo conveys our joint work developing a clinic on tank cars and how to model them, something we originally presented jointly, using 35-mm slides, and which in later years morphed into Powerpoint and to much more modern models. I continue to update it from time to time, and am still giving it occasionally. Larry did have one enthusiasm I didn’t share—stock car racing. He subscribed to Auto Racing News, and though he followed NASCAR, his real interest was in the smaller-time racing scene, including dirt tracks in the Pittsburgh area. I did go to local races a couple of times with him, but for me it was far less fascinating. Although it’s been 20 years since I moved to Berkeley from Pittsburgh, Larry and I had remained in frequent contact, by phone in earlier years, more and more by email in recent years. We saw each other every year at the big modeling meets around the country, and I think we both relished the chance to to sit down over a meal or a beer and talk modeling—or just about our personal lives. He was a close friend, and I know I will continue to miss him. Last year, I posted a summary about waybill preparation, quoting Tony Koester’s friend Harry Dolan, who described in some detail his recollection of typing waybills when working for the Nickel Plate. That post can be seen at: http://modelingthesp.blogspot.com/2013/06/waybills-29-waybill-preparation.html . Recently Tom Dill called my attention to an article by Dave Sprau, who started work as a telegrapher for Northern Pacific; he hired on in 1960 and in 1964 was promoted to dispatcher. He later worked for Great Northern and Milwaukee, among others, and retired in 1998. He is one of the authors of the recent outstanding book on operation, published by the Operations SIG of NMRA, entitled “19 East, Copy Three”. The article in question was called “Snoqualmie Days,” and describes some of Dave’s experiences as a relief agent at Snoqualmie, Washington in 1963. It was published in the Northern Pacific Railway Historical Association magazine, The Mainstreeter, Volume 20, No. 4, Fall 2001. Part of the story is his description of waybill procedures and preparation. With Dave’s permission, I quote a few parts of the article here. “All I had to do at Snoqualmie was station work. I hated station work. The North Bend Local would bring in [loaded] cars, and I would take the waybills and abstract them, and make freight bills. When loaded cars were shipped out, I would have to make out the waybills. “Weyerhaeuser had their own traffic office right in town, at the mill headquarters. They would fill out and bring bills of lading to me with the routing and freight rate already figured out. Weyerhaeuser had their own tariff books where they would look up those rates. I just billed the cars out based on their information, which turned out not to be infallible. “When ordering empty cars for loading, you would always specify where the shipment was going. You would tell the car distributor, ‘We need a car for lumber to Los Angeles.’ He would send you a Southern Pacific or Union Pacific car. ‘We need a car for lumber to Kansas City.’ He would send you a Burlington or Rock Island car. The idea was that once the car was empty it would immediately be available for use again, or at least it would get back to its home road more quickly. There is much more to Dave’s account, but this is the most pertinent waybill part. His account fits well with what I have learned by talking to others who did “station work” (as Dave calls it) or who worked as car clerks. Prominent among these is Jerry Stewart, who not only explained much to me, but also was kind enough to read and correct my first writings on this subject. I remain amazed at how many misconceptions I had, and which Jerry has tried valiantly to remove. Doubtless some remain, but it isn’t for lack of effort on Jerry’s part. To make sure that the whole waybill process is clear, here is an outline of it, which I use in my clinics on this topic. A shipper who wants a car to load calls his local agent (or in a city, a Car Distributor) and says what the load is and where it’s going. The agent or Distributor arranges to get the empty delivered to the shipper, who fills out a Bill of Lading with all the particulars of the shipment. As Dave indicates above, large shippers had their own traffic people, who would choose routings, and would usually correctly identify tariff rate and categories for the load. (Although Jerry Stewart remarked that at least half of all waybills he saw as a Chief Clerk had corrections on them.) These Bills of Lading were used by the agent or Distributor’s clerk to prepare the Waybills, which accompanied the shipment to its destination. When the loaded car was delivered at its destination, the Waybill ended up with that local agent, who prepared the Freight Bill to collect payment for the transportation. Dave mentions this also in his comments above. I have discussed all three of these prototype documents in a prior post; it is at: http://modelingthesp.blogspot.com/2012/07/waybills-26-prototype-documents.html . Modelers may choose to duplicate as much or as little of all this process as they like. I know from many layout visits that the interest out there in prototype waybills ranges from pretty substantial, to just about zero. That of course is a personal call. Should it mean that some readers of this blog will skip posts about waybills? I don’t know about that, but I always think we are better off to have more knowledge about a subject, rather than less, so we know what we are omitting if we choose to model only part of a topic. That is why I continue to be interested in, and write about, prototype waybills. Awhile back, I posted a brief summary of the prototype information on Southern Pacific F-unit freight diesels, to provide some background for modeling. It’s at: http://modelingthesp.blogspot.com/2014/02/southern-pacific-f-unit-diesels.html . 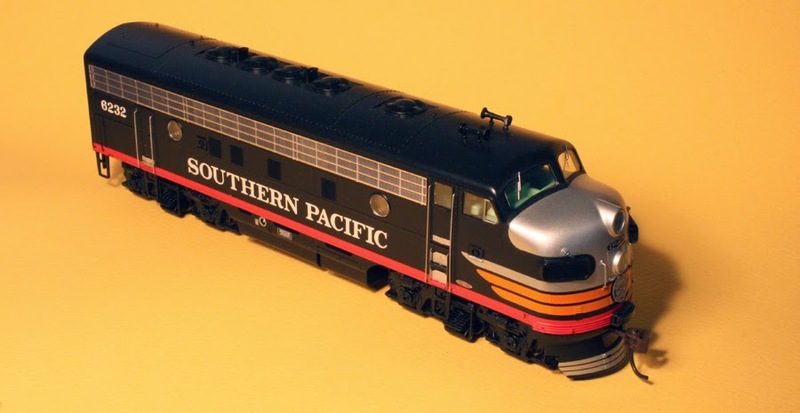 I followed that with a description of some old-technology Athearn F3 units I built by superdetailing an A and a B unit; that post is at: http://modelingthesp.blogspot.com/2014/03/southern-pacific-f-units-modeling-f3.html . In the present post, I will describe almost the opposite extreme in model technology, the Athearn Genesis F units and what I am doing with them. I began with the purchase of a powered B unit, fully equipped with DCC and sound. I wasn’t quick enough to find one decorated for SP, before Athearn (and many a hobby shop) was sold out. So I bought one for another railroad, which shall remain nameless, and repainted it. For SP F7-B units, this is pretty simple. The unit is all black, except for a Daylight Red frame stripe. I airbrushed the stripe area with the red, and when it was well dried, masked it with drafting tape and sprayed the rest of the unit black. Touching up the stainless steel kick plates at the doors with Old Silver, and all handrails with white, I only had to apply the unit number. This number should fit within the SP classes of B units with steam generators (SG), as my Genesis unit has the SG roof details. My best bet was Class DF-4, SP 8086–8139, which were delivered between June and October 1949, all SG-equipped. Although 16 of these 54 units were sent off to the T&NO during 1952–53, as Joe Strapac documents in his Volume 3 of the series, Southern Pacific Historic Diesels (“E-Units and Passenger Fs”), the majority, 36 units numbered 8090–8095, 8102, 8103, 8106-8111, 8114–8119, and 8122–8139 remained on Pacific Lines. As late as 1953, my modeling year, they were freely used in freight service. I used Microscale set 87-201 for the numbers. When done, here is how it looked. Not dramatic, I know, but very SP for all that. I have rubbed some paint off the “stainless” Athearn grill, and should remove some more, but prototype photos in the early 1950s do not show much brightness in this area. This unit carries the number applied by Athearn, which happens to also fall into Class DF-4, the A units of which had boiler controls so they could work with the SG-equipped B units. And again, SP 6232 was among the 36 units of Class DF-4 which were not transferred to T&NO. So there is some logic to locomotives 6232 and 8092 being together, even if in freight service. I don’t know for sure that I will keep these two units as a pair, but they are a reasonable set for now. The only problem at this point is to provide lights in the A unit, under control of the DCC decoder in the B unit. The lights should be attached to the A-unit shell, so my plan is to connect the two forward-light wires of the decoder, through a 2-pin miniature connector at the end of the B unit, to a 2-plug connector on the A unit frame, and I’ve got it. Sometimes you gotta love modern technology. But the A-B set is already in service, despite lack of working headlight. To repeat what I said about my F3-A and -B pair, my layout is small enough, and trains short enough, that an A-B set looks all right, and with my totally level main line, provides enough power, so only one unit needs to be powered. This modern Athearn Genesis A-B set fills that bill. 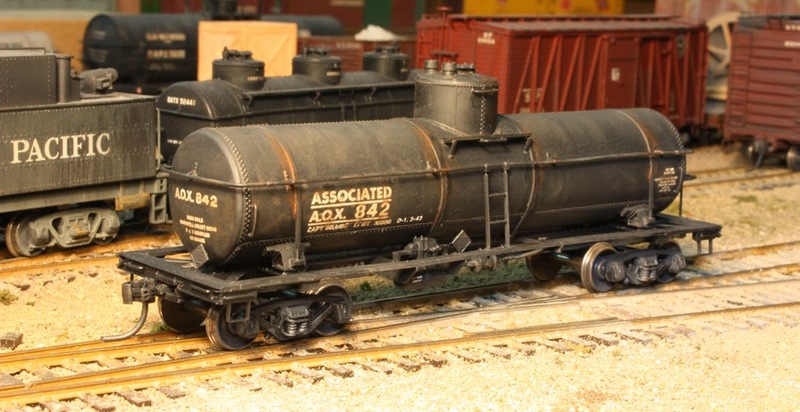 In connection with modeling a bulk oil dealer, I have posted a couple of descriptions of Associated Oil Company tank cars, most recently at this link: http://modelingthesp.blogspot.com/2014/03/associated-oil-company-tank-cars-part-2.html . These descriptions also rely on an abbreviated company history which I posted awhile back, which can be found at: http://modelingthesp.blogspot.com/2013/12/associated-oil-company-background.html . 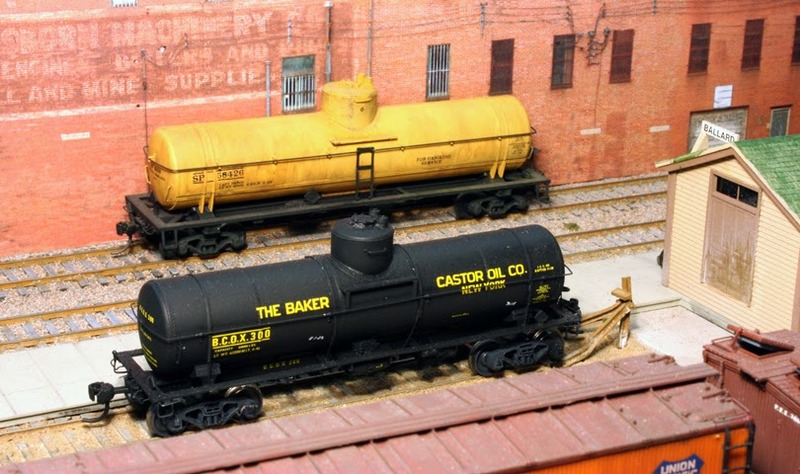 Construction of the model of an Associated Oil bulk dealership on my layout was described in my MRH column, as I have posted: http://modelingthesp.blogspot.com/2014/03/associated-oil-co-modeling-oil-dealer.html . I found in my stash of kits an undecorated InterMountain kit for an 8000-gallon AC&F tank car, which if I can modify the underframe, could successfully model AOX 842. The underframe work looked do-able to me, so I went ahead with the kit. This is a straightforward construction project without any great complexities, so I won’t devote any space to the routine parts of the job. But three modifications I did may be worth mentioning: the weights for the car, the underframe work, and the extra pair of tank hold-downs. I also made a few variations in the kit assembly itself, which I’ll mention as I go along. InterMountain did not include car weights in the kit, so I decided to use half-inch steel nuts, 1/2-13 in size, which weigh almost exactly half an ounce each and only cost 21 cents at my local hardware store. Four of them amount to 2 ounces, and fit neatly into the top of the tank car body. I glued them in with canopy glue; see: http://modelingthesp.blogspot.com/2013/05/a-few-words-in-praise-of-canopy-glue.html . The tank half is shown in the kit-box cradle I use for tasks like this. 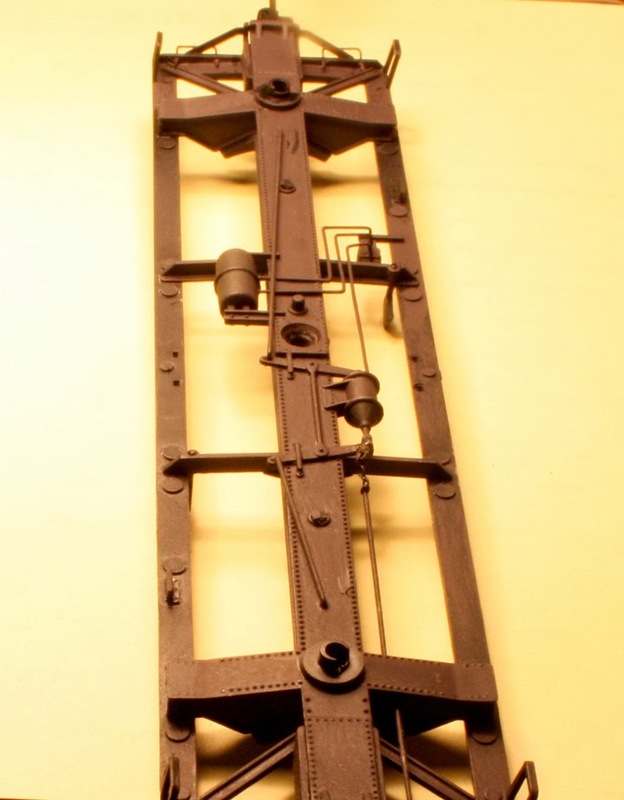 I described its very simple design and preparation in a prior post, also showing its use, at: http://modelingthesp.blogspot.com/2013/05/a-working-cradle-for-model-freight-cars.html . I glued the nuts in the top half to make sure they clear the well into which the tank dome is set. For my second modification, the underframe, here is how the kit part looks, viewing the underside of the frame. The side and end sills are visible from this angle (you can click to enlarge). I left a vestigial sill at the bolster (as the prototype had; compare the appearance in the prototype photo, shown in the first link cited at the top of this post). I also left a short sill to support the sill step at the end of the frame (side grab irons remain to be installed). Removing most of the side sill will at least suggest the appearance of the prototype. At this point, I mostly proceeded with assembly of the kit. One minor change I made was to substitute brass wire grab irons on the dome, as I (and others) often lift or handle tank cars by the dome, so for me, these grabs must not be fragile. I also added grab irons above the sill steps by simply using styrene rod. The more important change was my third modification, adding the pair of tank hold-downs or bands on either side of the dome, quite visible in the prototype photo at the top of my second post about Associated tank cars ( http://modelingthesp.blogspot.com/2014/03/associated-oil-company-tank-cars-part-2.html ). The tank bands were modeled with styrene strip. I chose to locate these right outside the dome walkways, and measured the chosen location from the end tank bands, inboard 9.5 scale feet. Those bands are convenient to measure from because they are present at the top of the tank, where a few rivets need to be removed so the new tank bands can sit flat, and then one can measure the same distance from the bolster center along the center sill, where a notch must be created on each side of the sill to accept the ends of the bands. I used a square No. 2 Swiss needle file to make the notches. My tank bands were made from Evergreen scale 1 x 4-inch strip, about 23 scale feet long (this is too long but the excess can easily be trimmed after attachment). For each strip, I placed its center over the tank top and held its ends down near the underframe, then allowed plastic cement to wick under the strip where it contacted the upper tank. In 20 or 30 seconds, the strip was securely glued to the tank. Then each end was glued and held in place at the center sill for 30 seconds or so until bonded. It’s that easy. You can see the brass grab iron on the dome in this view. The 1 x 4 strip is a little wide, but I had no 1 x 3-inch strip on hand. Incidentally, I encountered what occurs in some InterMountain tank cars, that the bottom surface of the tank mounts at the bolster don’t contact the bolster itself, as they should. I just added shims of styrene strip, fitting the shims to each individual location, to fill these gaps. Those strips are the white lines you see next to the walkway on each bolster in the photo above (click to enlarge). In the remaining parts of the kit assembly, I followed directions, except for substituting brass wire for the brake staff, something that seems to me essential for durability. I did use the kit’s bottom bracket, which I cut from the styrene brake staff. I added Kadee #58 couplers, and placed Reboxx 1.010-inch semi-scale wheelsets in the kit truck frames. For decals, I applied the Funaro & Camerlengo set mentioned in the MRH column, which is for Associated cars of ARA Class II (erroneously shown in the F&C decals as AAR II). But the car I am modeling was built in 1929, and would have followed the ICC 103 specification. For the tank test data block, then, I used part of the SP decal set from Jerry Glow, that was done from my art work (see http://home.comcast.net/~jerryglow/decals/full.html ). Once all decals were applied and protected with an overspray of Dullcote, I weathered the car with my usual acrylic color mixes; for a summary, see: http://modelingthesp.blogspot.com/2011/10/weathering-clinic-handout.html . I also added a little rust around the tank bands, using a wash of Burnt Sienna. Why? Here is an enlargement of part of the photo of AOX 842, shown previously in its entirety (cited at the top of this post). Note that as the tank has expanded and contracted with temperature variations, restrained to do so along the long axis of the car, the tank has rubbed the paint under the tank bands, leaving slight but visible rust stains at the bands. One additional point: route cards on tank cars were often tacked or stapled to the edge of the wooden running board. You can see remnants of such cards above, on the side of the walkway near the bolster (click to enlarge). It’s interesting to have an additional tank car in the fleet, in this case one modeled from a prototype photo, but mostly I look forward to switching this car at the Associated oil dealership in my layout town of Shumala. I recently posted a summary of the rules for air brake servicing, and in particular the stenciling on the freight car which recorded this service, because that’s the part that we as modelers can and should reproduce. The post can be found at this link: http://modelingthesp.blogspot.com/2014/04/brake-service-rules-and-modeling.html . Partly in response to inquiries I’ve received, I want to expand on the topic in the present post. The lettering size, 1-1/2 inches, is also indicated here. 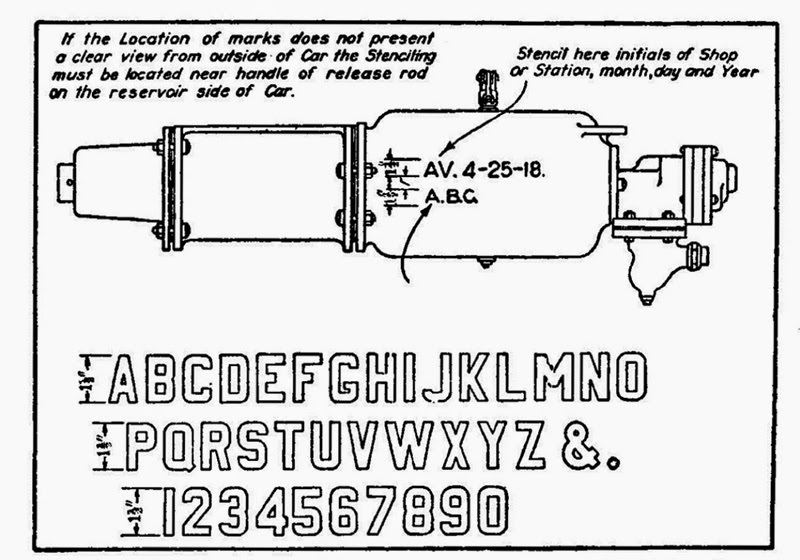 As I mentioned in Part 1 of this thread (cited above), and as is noted on these drawings, if the reservoir were so located as to be difficult to see clearly from the car side, it was suggested that the brake servicing stencil be placed on the side of the car near the reservoir location. Prior to 1958, the maximum interval between brake servicing was 36 months. One would thus simply add three years to the year shown in the stencil, and see if the validity period had expired. As with reweigh intervals, the month shown in the stencil is the last month of validity, in that third year. Prototype photos of freight cars, in which reservoirs are fully visible, show that workmen stenciling this information by no means always followed the rules as to location and arrangement. One possible reason for that would be simple convenience, since a repacking stencil is similar, and might already be prepared; just apply it to the brake reservoir. Part (a) of Interchange Rule 60 states that “standard air brake markings, as shown [above] . . . are required on all cars,” but this evidently means the content specified is required, not the arrangement. Or else it means that exceptions were tolerated. Those prototype photos also show, in many cases, that the reservoir stencil cannot be read, and is either partially or entirely obscured by dirt. Accordingly, I would not try to have a visible stencil on every visible model reservoir, just because the same was true of the prototype. As I mentioned in the first post on this topic, we modelers can choose whether we want to stencil all the reservoirs (or nearby car parts) of our model fleet of freight cars, or not. Personally, my choice is to apply brake stencil decals to some of the most visible reservoirs, with no effort to do anywhere near all of them. But you, of course, can choose the course that works best for you. In the most recent issue of the Southern Pacific Historical & Technical Society magazine Trainline, my regular column, about modeling the SP, was entirely devoted to ways to correct the HO scale model by InterMountain of a 12-panel box car to match the SP prototypes of classes B-50-25 and -26. Probably the biggest visual change recommended is the substitution of correct doors. Both the early “wide-seam” door of the 1946-built B-50-25 cars, and the subsequent “standard” welded door of the later -25 cars and all of Class B-50-26 (both pictured in the column) can be obtained from Southwest Scale Productions. For more information, you can visit: http://www.southwestscale.com/Freight-Car-Details_c3.htm . 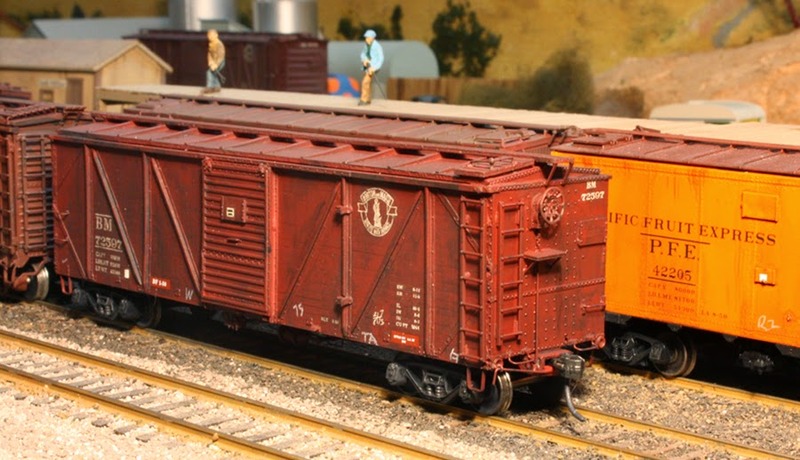 The column described a conversion kit for the InterMountain model which has been offered by Andy Carlson; it includes a car body and details to accomplish all the needed changes to make a correct SP box car. My column also offers recommendations for trucks, running boards, and decals. Andy’s kit costs $27, though availability may vary from time to time, depending on his parts sources, so I recommend being prepared to be patient. You can email him at this address: midcentury@sbcglobal.net . That issue of Trainline, No. 119 for Spring 2014, is now available for sale on the Society’s website at this link: http://www.sphtsstore.org/servlet/the-Trainline-back-issues/s/113/Categories . Price is $9.95 for anyone wishing to obtain one. An important item of decal news in that column is that the fine Speedwitch decal set for classes B-25 and -26 (and which can be used for a number of other SP box car classes too) has been reprinted. It is Item D110, and you can order it at this link: http://speedwitchmedia.com/product/d110-southern-pacific-and-texas-new-orleans-b-50-25-aar-box-car/ . Speedwitch has also reprinted their set D114, for SP and T&NO 1937 AAR box cars, covering classes B-50-18 through B-50-21, and B-50-23. The prototype information in that column is abbreviated for space reasons, but all the specifics on car specialties is contained in my Volume 4, Box Cars, in the series Southern Pacific Freight Cars. That volume has been out of stock at Signature Press for some time, but has been revised and enlarged (it’s now 16 pages longer), and is expected shortly from the printer. As soon as it is in stock at our warehouse, it can be ordered securely from the Signature Press website at: http://www.signaturepress.com/thompson/SPF4.html . Most modelers are familiar with the fact that for many decades, most freight cars had to be reweighed periodically to ensure accurate light (or tare) weights, which in turn could be subtracted from the weight of a loaded car to obtain the net weight; the net of course would represent the weight of the cargo and be the basis for billing. I described this process in a short article for Railroad Model Craftsman in April 2011, but unfortunately there were some editorial problems with how it was presented, so I went back and created a corrected version, which was linked through my blog. You can access it, if you’re interested, at: http://modelingthesp.blogspot.com/2011/03/reweigh-article-from-rmc.html . Truck journals also had to be repacked periodically, in the days before roller bearings, largely done on the basis of need, but with solid or plain journal bearings, this was done at intervals of a year or so. Like the reweigh date, the repack place and date was stenciled on the car. To illustrate, here is a photo of a Boston & Maine box car model (Sunshine kit 91.6, depicting the 1923 ARA box car design), and the contrasting paint color of the patches makes obvious the lettering for both the reweigh (left of the door) and repack (above the right bolster) application. One of the nice things about the Sunshine “reweigh data” decal sets is that they included repacking data blocks also, and the lettering on this model is from that source. You can click on the image to enlarge it if you wish. But this post is not particularly about either reweigh or repack stencils; I just mention them for completeness. There was a third periodic service that was performed, to clean, oil and test (COT) the air brakes, then record the work with a stencil (S). Since 1972, this has been recorded on a COTS data block, but in earlier years it was stenciled right on the brake reservoir, or elsewhere on the car. But exactly how, and how often? I am indebted to Guy Wilber for supplying a summary of the rules on this point, and below I quote his comments in their entirety. “Air brakes known as ‘AB’ brakes were required to be serviced every 36 months under the provisions of Interchange Rule 60. That service interval was a standard from 1934 until extended to 48 months by supplement to the 1958 Interchange Rules. In that period, ‘K’ brake systems were required to be serviced every 15 months. I would have to look up the exact date that the service increment was extended to 15 months, but early on, the interval for ‘K’ brakes was every 12 months. The 15-month interval was in effect from (at least) the early 1930s into 1953. All references to ‘K’ brakes were taken out of the Interchange Rules, effective January 1, 1960. “Prior to servicing the brake system the stenciled data applied when cars were new, or after the last service date, was recorded by the current servicing railroad for use in billing the owning railroad. Once cleaned, oiled and tested; all old stenciling was to be scraped away, painted over, and new stencils were to be applied as such; railroad shop initials, date (m-d-yr) and the servicing railroad's reporting marks. “Shop initials and the date was on the left side of the ‘AB’ combined reservoir and the RR reporting marks were on the right. The shop initials and date were stacked over the RR reporting marks if placed on the end of the reservoir, and they were stacked in the same manner on the smaller air reservoir of ‘K’ brakes. “This was standard practice from the introduction of the ‘AB’ brake system through 1959. Stencils for brake components were 1 inch in height until 1938 when they were changed to 1-1/2 inches in height. Anyone wishing to duplicate this kind of marking can readily do so, as I’ll explain below, even though most decal sets do not include any of the needed lettering. But remember these two points: first, the reservoir on many cars was not very visible, due to side sill configuration or reservoir location, so many models would not visibly benefit from brake service stenciling. Second, prototype photos often show the reservoir so dirty that the service stenciling cannot be seen, or only part of it is seen. Tank cars are usually cars whose reservoirs are clearly visible (though sometimes they are mounted alongside the center sill). 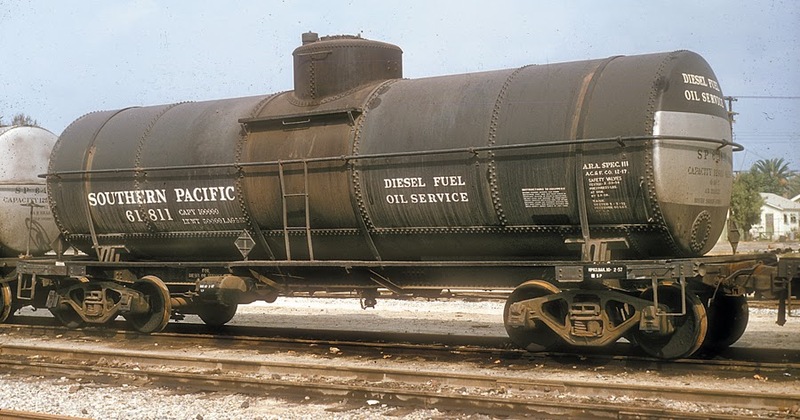 Here is an example of a very visible and stenciled reservoir, in a Bruce Petty photograph of an SP tank car in diesel fuel service. To show the reservoir better, here is a detail of the above photo. Note that the stenciling here is not consistent with the rules quoted above. The railroad initials are stacked below the shop initials and date, all on the left side of the reservoir. This arrangement is more like a repack stencil, which opens the door to simply using decals for repack stencils in this application. That’s what I meant by saying that modelers could “readily” apply this lettering. In my own modeling, I have not decaled too many of my visible brake reservoirs, because in lots of prototype photos, this stencil simply doesn’t show up. The observation is logical because the car bottom is the dirtiest location, and no doubt dust and grime quickly covered the stencil on the reservoir. But I think it is good to have a few reservoirs visibly stenciled, and that is what I do, usually on tank cars. Remember that having some lettering in the right location is much more important to the overall impression than having the correct place or date in the decal. Here is one example. This is my model of SP Class O-50-11, with circumferential rivet seams; it was described at: http://modelingthesp.blogspot.com/2012/10/modeling-sp-tank-cars-4-circumferential.html . The right side of the car, which has no dome walkway, is shown in this view. One might say the brake service stenciling is such a minor item of lettering, that it is not worth including. But like many details, this is one which, when noticed, can give the impression that everything is well detailed. And if this kind of decal application causes me to be seen as a meticulous modeler, well, I’ll just have to live with that! The last time I posted about the Shumala extension, I described preparing the sky painting, and getting it blended downward toward the horizon with lighter and lighter blue, although nothing was included about painting the landforms which form the skyline. That earlier post is at this link: http://modelingthesp.blogspot.com/2013/03/shumalas-extension-part-5-painting-sky.html . There has been a lag of some time since that post, the better part of a year. 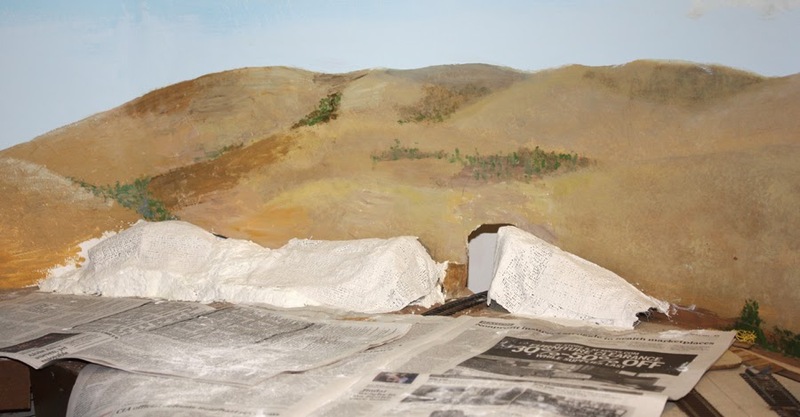 The main reason was that I wanted to paint the landscape portions of the backdrop painting all at one time, on both sides of the backdrop, not only on the Shumala extension, but also the backdrop extension on the other side at Santa Rosalia. A recent post about Santa Rosalia’s backdrop can be found here: http://modelingthesp.blogspot.com/2014/01/constructing-santa-rosalia-backdrop.html . My idea for the Shumala backdrop extension was to bring the “nearby” hill shapes to a termination, and to show much more distant hill profiles at left as a bluish gray outline. I used the acrylics that suit these “California colors,” primarily Yellow Oxide and Raw Umber, with plenty of White to lighten it, and some Neutral Gray for distance. Distant vegetation is Chromium Oxide Green, mixed with some of the brown or gray for distance. Note here that the vertical white patch, evident in my prior post (cited above), has been repaired also. The white area just about at photo center is some paper towels. They are in an area which will become a hillside. The cut through that hill will help hide the track disappearing through the backdrop. To make the hill, I used some styrofoam sheet I had saved, and broke it up into suitable pieces, which I then glued down with yellow carpenter’s glue. The rough base of the hill shown in the photo below is not very much like the final contour I want, but it’s a start. You can see the backdrop hole I want to make less obvious. Next I rounded off the contours and filled gaps, using Sculptamold paper mache. I quickly realized I hadn’t gotten the hill shape I want, but it was closer, and now the needed modifications were more obvious, particularly the need to make the height a little bigger. Here’s a photo at this point. 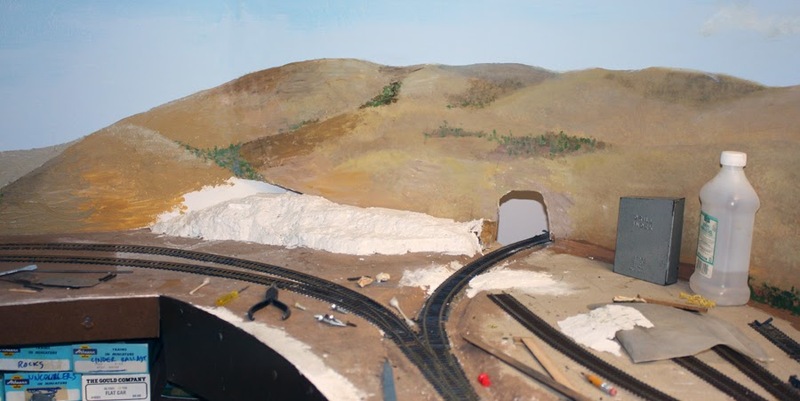 I also wanted to continue the hill on the nearer side of the track, so that the cut would make sense. I used some old screen wire (the galvanized kind, not the aluminum or plastic kind) to make a rough contour, then used the Woodland Scenics Plaster Cloth to cover it. I discussed using this convenient and effective material in redoing the Ballard hill in earlier posts (for example, at: http://modelingthesp.blogspot.com/2013/12/repairing-ballard-hill-part-4.html .) Here is how my new hill contours around the backdrop opening looked after applying the Plaster Cloth over the formed screen. Ordinarily, the Shumala roundhouse would fill the right foreground, but it has been moved out of the way of the plastering work. From there, contours will again be refined with Sculptamold, as in previous steps. (I’ll describe it in a future post.) Experienced scenery modelers will doubtless recognize in this process what a novice might not: a sequence of creating a profile or surface, evaluating it, correcting by adding or removing material, and evaluate again: continue until satisfied. As I have said to novices, don’t panic, don’t even worry, if it doesn’t look right at first, but keep at it until it does. I have written in a number of previous posts about the process I follow in upgrading the overall fleet of freight car on my layout, both in terms of improving existing models, and in other cases, replacing models with better alternatives. My most recent post about this, which includes links to earlier posts, is at this link: http://modelingthesp.blogspot.com/2013/10/evaluating-freight-car-fleet-upgrade.html . In the present post, I give another example. 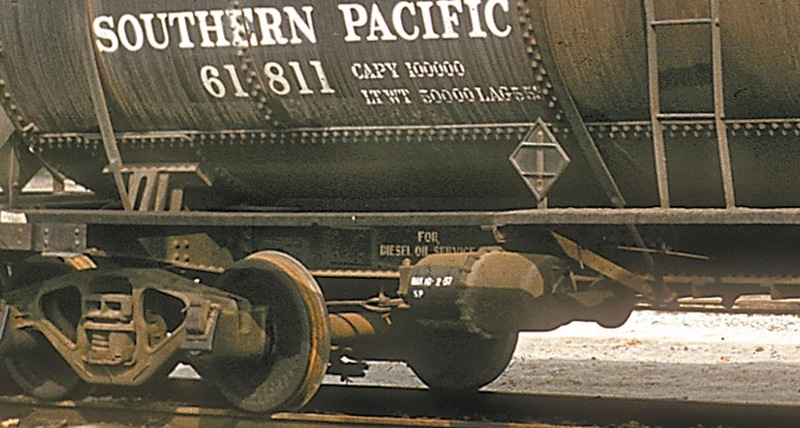 After World War II, Southern Pacific bought its last class of 40-foot automobile cars, Class A-50-16. Delivered in November and December of 1947, these had modern (Improved Dreadnaught or ID) ends and wide double doors, and were numbered 66175–66674. For a number of years there was no easy way to model the basic body, and instead I assembled a stand-in, using the old McKean double-door car body. The model really depicts a later car, with a later design of ID end, what is called a 1+3/4 end. That means two end panels, the upper with three major ribs, the lower with four, and the “1” refers to a different kind of rib at the top of the upper panel, rectangular in this case. The model also has a diagonal-panel roof, whereas the SP cars had straight-panel roofs. This image, taken from an old slide, makes the car look closer to brown than boxcar red, but the model in fact is really boxcar red. And yes, that stock car to the right, lettered for California Livestock Dispatch, does not represent a real owner. Sunshine Models offered a kit for some years for a correct model of SP’s Class A-50-16, with correct 4/4 ID end, straight-panel roof, and 7-foot doors (kit 40.2). Recently I arranged to have Dennis Williams build and paint one for me, and I applied decals and weathering. It is shown here in front of the Shumala depot. The older model car, the McKean stand-in, will be sold, and only the new and correct model will grace my occasional operation of a cut of cars carrying auto parts and automobiles along the SP Coast Line on my layout. I have written in several places abut modeling SP’s 12,500-gallon tank cars from Athearn tank cars, most thoroughly in my revision of an older article originally published in the Southern Pacific Historical & Technical Society magazine, Trainline, issue 71 (Spring 2002). That issue is available from the Society on their website, at: http://www.sphtsstore.org/servlet/the-Trainline-back-issues/s/65/Categories , but my 2011 blog post with several updates and revisions is probably more useful at this point. That post can be accessed at this link: http://modelingthesp.blogspot.com/2011/05/modeling-sp-tank-cars.html . The most visible deficiency here is that the bottom sheet of the tank is black (a natural result of the Athearn division between tank top and bottom), but the prototype tanks were entirely yellow (actually the depot color, Colonial Yellow). The Athearn yellow is not the same as Colonial Yellow and ought to be corrected. And in saving the paint/lettering, I also had not removed the extraneous double rivet rows on each side of the dome. Since correct decals are now available (from my artwork, as described in a prior post, at: http://modelingthesp.blogspot.com/2011/05/sp-tank-car-decals.html ) I could now go ahead and make the various body corrections. Another reason to reletter the entire car was so that I could correct the Athearn lettering size, which is generally too large, and also the Athearn car number, which belongs to Class O-50-13. I am not aware that any cars of that class were actually assigned to gasoline service; most were from Class O-50-12. The first step was to disassemble the tank from the underframe, readily accomplished with Athearn tank cars. As you can see in the photo below, the car’s underframe had also been upgraded, adding brake piping and rodding. This is especially worthwhile in tank car models, because these additions are quite visible, more so than on, say, box cars. I began work on the tank by shaving off those incorrect rivet rows, and removing the extra dome platform on the right side of the car. (See my updated modeling post, cited at the end of the first paragraph of the present post, for specifics on these tasks.) Once the body was cleaned up, I airbrushed it with Tru-Color’s paint no. TCP-153, Colonial Yellow. This paint does airbrush beautifully and gives a smooth and slightly glossy surface for decals. Shown here is the left side of the car, which has the dome walkway. I will re-use the Athearn handrail supports, even though they are oversize and not located at the same spacing as SP’s tank car handrails, because the black railing tends to draw attention away from the supports. I mentioned my SP tank car decals above. The next step then was to letter the tank. I chose the railroad initials rather than the spelled-out road name introduced in 1946, because practically all photos of the yellow tank cars are in the pre-1946 scheme. 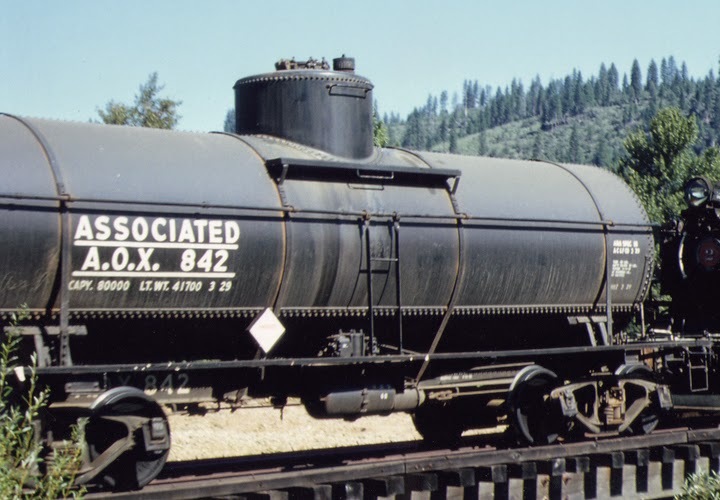 Once lettered, the tank body looked like this, with a number chosen from Class O-50-12, which as I mentioned was the predominant class in gasoline service. On the tank at this point, there is no reweigh date. Tank car cargoes were billed by gallonage, not by weight, so the car’s light weight was of no importance (unlike all other types of freight cars). 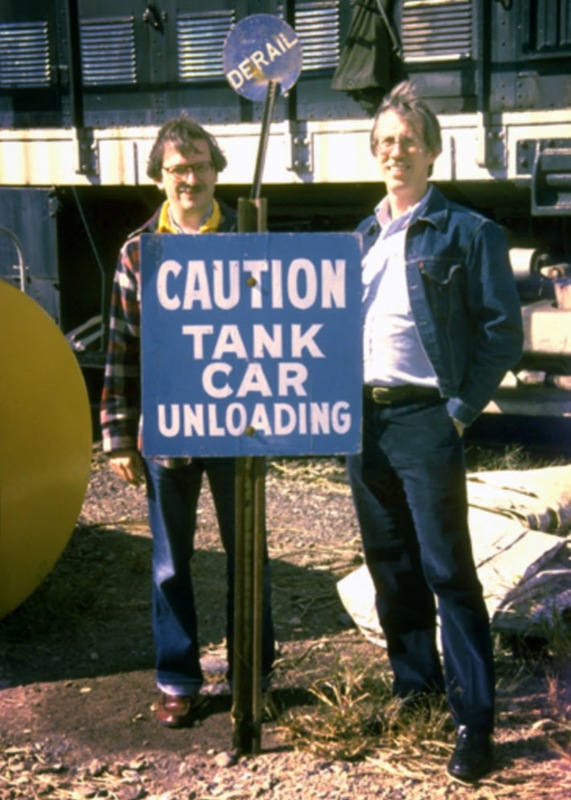 Prototype photos commonly show tank cars having weigh dates a decade, or even multiple decades, prior to the photo date. But when cars were repaired, they were ordinarily reweighed, and SP tank cars often do show that change. Accordingly, I used the Sunshine PFE set of black reweigh and repack data to choose a 1942 reweigh date for this car. Now the tank car was reassembled and weathering applied to everything. The final result, photographed on my layout in the same location as the original model at the top of this post (right across from the Ballard depot), shows the weathered yellow color, including the correctly yellow bottom sheet. The foreground tank car, incidentally, is a Sunshine model of an 8000-gallon General American car with circumferential rivets, kit 99.3, built by Dennis Williams, and with decals that I applied, set BOCX-1 from Protocraft Decals. Protocraft emphasizes O scale, but they do have HO scale decals; you can see their on-line catalog at http://www.protocraft.com/category.cfm?Categoryid=36 . The modeling work in this gasoline car upgrade has been described in more detail elsewhere (my prior post, cited in the first paragraph of this post), but the color choice and decal lettering seemed to sufficient interest to describe here. I can now operate this gasoline car without having to explain why it’s not accurately painted.